Tortillas are so versatile. A stack on hand can lead to breakfast burritos, soft tacos, fajitas.... They can even be a quick dessert: lightly butter, sprinkle with cinnamon and sugar and toast in the broiler. The Cadet likes them plain, G-man likes them folded over with a bit of melted cheddar in the middle, and Stealthy Dad will eat them any way I throw at him. Before we started watching our sodium, we added flour tortillas to the cart every time we went to the grocery store. Checking the label was a shock. The small Azteca flour tortillas contain 390mg of sodium each, and we could easily eat three apiece. The shelf-stable store brand tortillas we were buying contained 700-900mg. (That must be why they were shelf-stable.) For several months after reading the labels, we just went without tortillas. My father in law sent us directions to make our own. 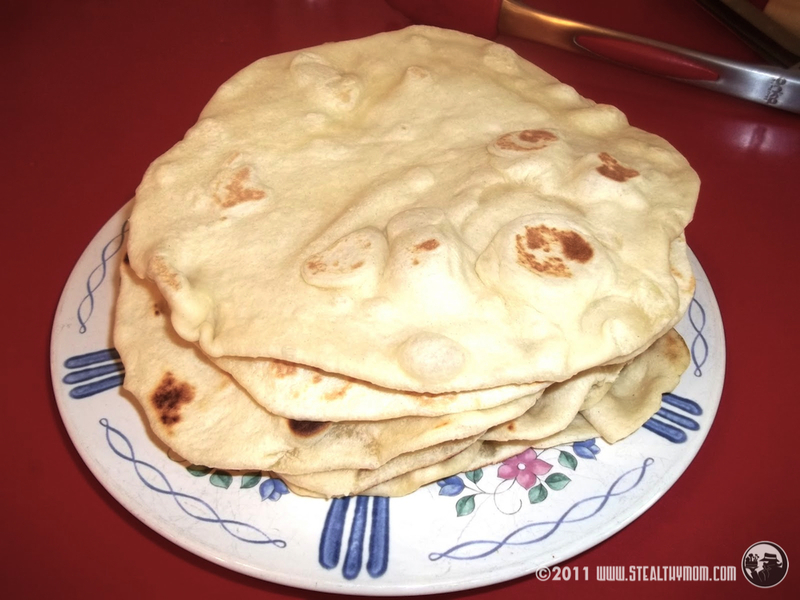 Tortillas, it turns out, are a cross between a bread and a pastry in structure. The recipe called for lard, which was understandable, but still made my heart sink. When used in baking, lard gives a light texture because it is solid when the dough is created and melts during cooking, leaving tiny air pockets. For reasons I will save for another rant, the Stealthy Kitchen stocks neither lard nor its chemical step-sibling, shortening. It was time for some trials and errors. This is what I came up with. Hot and fresh from the pan, these tortillas are soft and tender. The kids run off with them as soon as they are cool enough to eat and Stealthy Dad loiters around the kitchen to sample. They are really easy, too! Mix the flour, baking powder and salt together in mixing bowl. Make a well in the flour, and pour in the olive oil and water. Mix well, making sure to work in all of the flour. When the flour is all mixed in and the dough is a soft ball, turn it onto the counter and knead for 6-8 minutes. Let the dough rest for at least fifteen minutes. Divide the dough into 12 portions. Form each portion into a small ball by rolling the dough outside-in with your thumbs. Pour a small amount of olive oil onto your hands, and pick up each ball, giving it a light coating of oil. Let the dough balls rest for an hour. Spray a cast iron skillet with olive oil and get it hot. Meanwhile, roll out your first tortilla, as thin as you can make it without it becoming too fragile to pick up, between 6-8". Place the tortilla on the hot pan. As soon as you see bubbles, flip the tortilla over. Silicone-tipped tongs work well for this. The other side will brown quickly. Using your tongs, grab the tortilla, flip it over and place it on a plate. You will get into a rhythm of rolling a tortilla while one is cooking so the process goes more quickly. Every two or three, re-spray the pan.